Racing will begin at 10:45 and continue until 13:00. Races will take place over 200m and 500m in K1’s. There will be two races over each distance. There will be a lunch break until 14:00. A 3K K1 race will take place at 14:00, followed by prize-giving at 15:00. Medals and series points will be awarded on the day according to the 500m & 200m performance within each class (male and female u10 u12 u14 u16 u18, u23, 23+, 35+). Points will be cumulated across the FRA series for class awards. Leaside CC would very much appreciate offers of help experienced timekeepers - please pass this on to any of the parents who are attending with their children and ask them to contact Race Organiser Alan if they would be able to help. 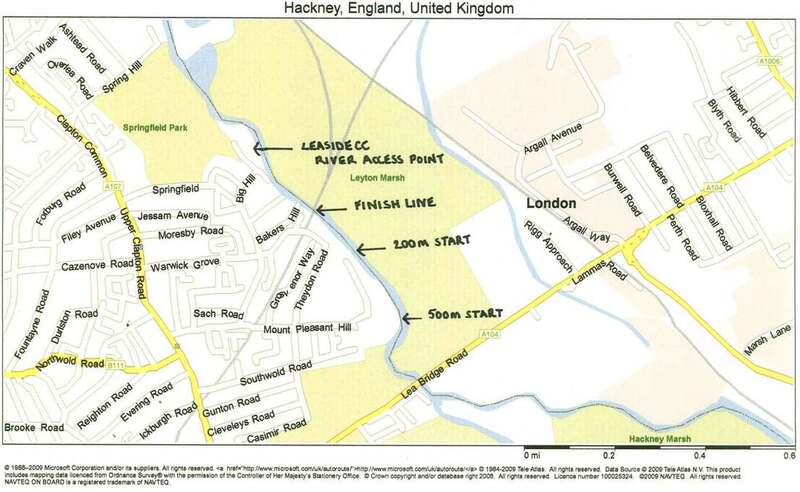 Racing will take place downstream of the canoe club, between the footbridge just north of the Lea Bridge Road and the Railway Bridge leading to Clapton Train Station. Kayaks can be taken out of the water and stored on the grass area beside the Railway Bridge. Supporters can walk to the race area via the foot bridge north of the club, then walk downriver on the east bank (5min walk). Please see map below for further detail. ​There is no shop within easy walk of Leaside CC or the race course. Hot and cold food will be available to purchase during the event at Leaside CC. There are male and female changing and shower facilities available on site. Entry Fee: £5 per seat for all classes (covers all races for the day). Payable on arrival. Only Registered Team Leaders can enter team members (register here for the series). Team leaders can then send their entries to the FRA Secretary by midday on Saturday. (BC insurance is required to participate - most paddlers will have this through membership of their club, on membership of BC, but where no evidence of either of these can be provided, it can be purchased separately for £5 on the day). Team leaders are responsible for ensuring the competency of their team members, checking the safety and suitability of their equipment and clothing, and ensuring buoyancy aids are worn when they consider it necessary. All u16 paddlers MUST wear a buoyancy aid. 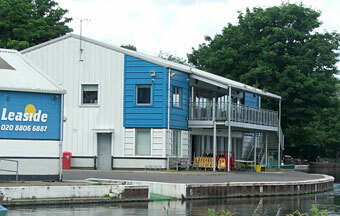 Please note the river Lea is a busy navigation channel. Please can Team Leaders advise all paddlers to keep river right when approaching any oncoming craft. Racing may be held up due to other craft using the river. Leaside CC will provide 2 rescue boats, and two bankside safety crews with throw ropes while competitors are on the water. There will be trained First Aiders at both Leaside and at the race course. Access to the club is via the A107 Clapton Common/Upper Clapton Road. Turn east off this road onto "Springfield" just next to a pedestrian crossing. Follow this road past Springfield Park on your left. At the end of this road you will come to a small T junction. Turn left onto " Big Hill" this road leads down a steep hill to the canal. At the bottom of the hill turn sharp left into "Spring Lane" (no road name sign). Leaside is about 200m along on the right. Please make sure that you have also read rules, safety notes and booking in instructions on the main Summer Series page.